Closed doors can trap you in a room. Traditional wedges have been used to keep doors open but these can easily become dislodged. Designed by a firefighter, The Warthog Hinge Hook is a simple, reusable, and more reliable device that can be inserted over the hinge of almost any door to aide in preventing door closure without damaging the door. It's made of zinc coated steel and is welded and bent in such a way as to keep the door open at a wide angle. The Warthog Hinge Hook allows a door to be temporarily opened further, but when released will keep the door open approximately 75 degrees. 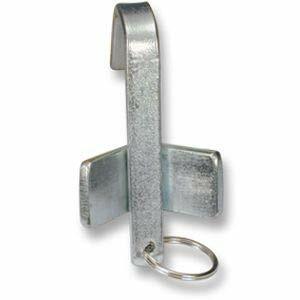 The Warthog Hinge hook is perfect for fire, police, SWAT, first responders, movers and delivery personnel, as well as housekeeping and other hotel staff. Note that The Warthog Hinge Hook is heavy duty and attempting to close a door with it installed could cause damage to the door and hinge! Versatile, compact and heavy duty zinc coated steel with handy split ring-easily attach strobe, cyclume sticks, etc.